Teen MPACT Breaks Mold of Partying Teens, LIVINGSTON, June 20, 2008 - In a day and age when teens run the roads after dark, often roaming from party to party,one man's vision shows teens the reward comes from helping others. On June 7, 2008 over 250 teens converged on the little town of Forestburg, TX. The teens came from various parts of Texas, including Uvalde, Pleasanton, Plano, Dallas and its surrounding areas, Corpus Christi and, of course, Livingston. There was also a group that came from Oklahoma. This gathering of teens, however, teaches teens the value and reward of helping others that are less fortunate. The event is called MPACT (Making People Aware of Christ�s Truth). Youth leaders and students work on assignments throughout the week from painting, building, demolition, and yard work for the elderly, disabled, and disadvantaged residents. The reason for this program is to share Christ�s love through simple acts of kindness. These students are not paid by any means to work on these assignments, but they themselves pay to come work at MPACT. MPACT takes place annualy (every summer) and so far has been going strong 12 years. Last year MPACT was held in Livingston, TX. MPACT founder Mark McBride says it's a labor of love and glorifies Christ; "It's not about us, it's about glorifying Christ through serving others". 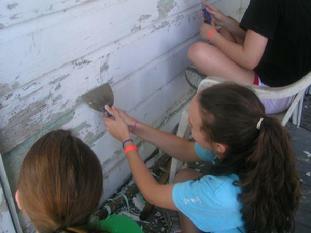 "It's about us being the hands and feet of Christ, and doing work so God gets glorified". McBride is thrilled to see students come from all over..."I love to see students from different belief systems come together to serve others..." he says "...they love it, they keep coming back". MPACT only lasts a week, but the "IMPACT" these kids have on this community will last for years. This year was especially exciting because there was such a big group of students; they had to be housed in the Forestburg School. Thanks to McBride's leadership and a host of other adult volunteers from churches, MPACT went off without a hitch and shows no signs of slowing down as it grows each year. MPACT is a ministry that's only just begun and will continue to teach kids about values that are greater than serving self as McBride and the ministry itself are poised to continue for years to come. Ben Boyd Graduated from Livingston High School in 2008 and will be attending the University of North Texas in the fall.